So a few weeks ago I was in Florida for familial reasons and selflessly took a day out to drive over to the city of live mermaids, Weeki Wachee Springs, which if you don’t know about now you will soon, to meet some extremely glamorous former mermaids – 71-year-old Vicki Smith and 61-year-old Barbara Wynns, both of whom are completely gorgeous and inspirational and will appear here in the next week or so to possibly blow your minds. Vicki and Barbara both perform in alumni shows at Weeki Wachee and run the Sirens of the Deep mermaid camp that yours truly will participate in in May. I know. There is still room in said camp, FYI. In between meeting Vicki for lunch in Brooksville, Florida, and Barbara at her mermaid-filled river home in Weeki Wachee early that eve, I drove up to some Crystal River, Florida, past manatee parks and clam shacks and signs that warn you to look out for loose bears, to meet Eric Ducharme, the Mertailor, a 20-year-old merman and tailmaker, at his home studio. 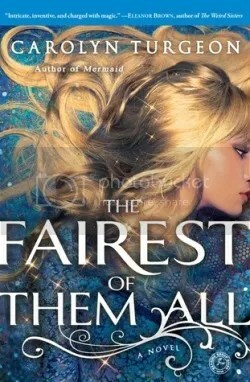 It was a wet, smoldering kind of afternoon in West Florida, which is really the ideal kind of afternoon to meet brilliant young mens in their houses after being told how amazing they are by former and did I mention highly glamorous mermaids. So Eric has performed as a merman for years, and is one of the top tailmakers in the business (there are others, too, whom I will talk to here). If you want a realistic and gorgeous-looking mermaid tail and are far too lazy to make your own a la Hannah Mermaid, you might want to get one of his. I first read about him, by the way, because he made Cynthia von Buhler’s mermaid tail for an infamous Manhattan party she threw last fall whilst reclining in a bathtub, surrounded by oil spill mermaids. More about that in an upcoming post. But when planning such stupendous soirees and in need of tail-like accoutrements, Eric would be the one to call. Super luxurious and incredibly gorgeous, his tails can range from a few hundred to few thousand smackers. While we talked, Eric did mysterious, magical things to a black latex tail as a line of super stunning silicone tails glittered and winked alluringly in the background. So how long have you been making mermaid/mermen tails? 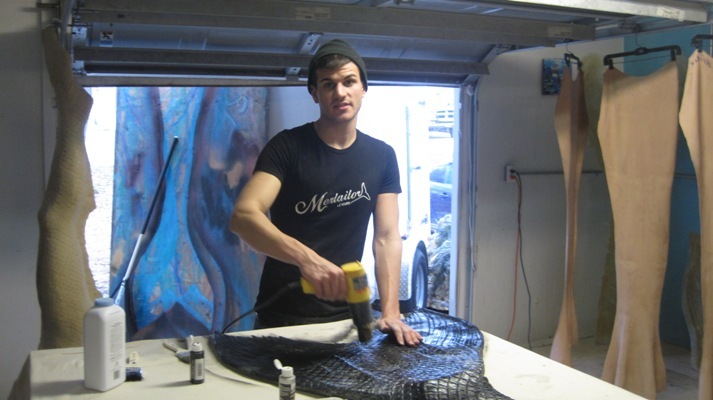 I started off as The Mertailor Eric Ducharme and formed Mertailor LLC. I have been in operation for approximately five years. What got you interested in merfolk generally? My grandparents lived behind Weeki Wachee Springs. 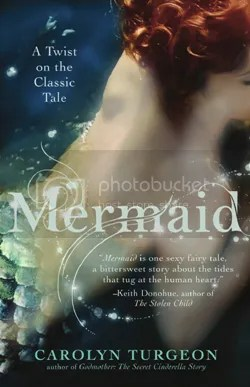 The mermaids and their tails intrigued me since I was five years old. My first memory at Weeki Wachee was standing in front of the glass, so close I could hear and feel the bubbles as I watched a dark-haired mermaid swim by in a gold lame mermaid tail. When did you begin performing as a merman? How does a 15 year old get into this line of work? I began attending mermaid camps at Weeki Wachee in the summers and when I was nine I met Barbara Wynns, my “mermaid mother.” She is a great woman and mentor. I love her dearly! Barbara was like me and knew how much I wanted to get in that spring on the airhose [Weeki Wachee mermaids breathe through an airhose]. She saw my potential and passion. She gave me my first mermaid tail, and had me scuba certified at thirteen. After that she had permission to train me on the airhose and showed me all of the ropes to becoming an underwater performer. I learned from the best – from Barbara and the other former mermaids. On the weekends and after school, Barbara would come pick me up from home and bring me to Weeki. We would swim in the spring, practice my ballet, and work on putting together underwater routines just for fun. Those were the days! At sixteen years old, I was hired as a merman/underwater performer. They call the guys princes, but I saw myself a little bit differently. I knew all of the ballet. I had always gotten complimented from fellow current/former mermaids on my form and underwater talent. I knew all of the numbers to each show in and out, every part, and every character. It was very unusual to get hired at sixteen. The rule was you always had to eighteen years old to become a mermaid, but they made an exception for me. It normally takes six months to train for a part in the show, but I was in my first show within a few weeks of getting hired. My biggest fear was jumping off of the roof into the water. After my first time jumping in, they could not stop me! It became one of my favorite things to do. 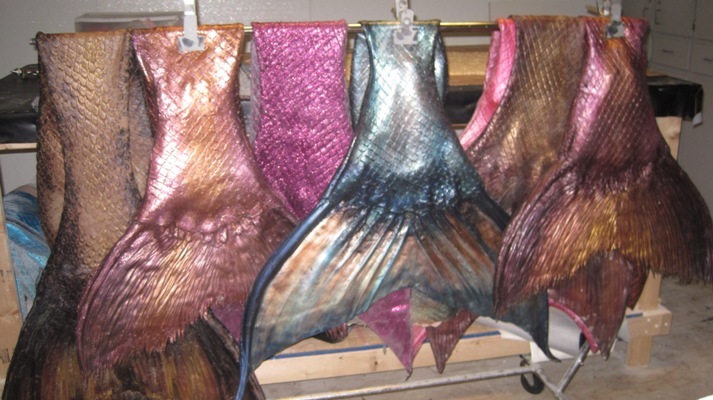 When did you first start making mermaid tails — and what inspired you to do it? This is a tough question! I cannot remember the first time I ever created a mermaid/man tail, but I can think back to all of the time I tried! From garbage bags, masking tape, fabric, bed sheets, you name it, it was a mermaid tail! I guess I always wanted my own tail. Unfortunately, my parents did not understand at the time, so I got creative like every young child does. I used what I had and tried my own. My grandmother has sewn me tails. One after another. She eventually got tired and said that I needed to learn how to make me own. She taught me some basic sewing ropes and I took it over. I got pretty good with my little sewing machine! I was making underwater costumes for Weeki here and there when I was about fourteen. I would donate mermaid tails, just to see them in the show and take photos of them! When I was fifteen, I received an order for fourteen tails from Weeki, then at sixteen, another order for fourteen tails, and it just went on from there. What is involved in making a really great tail? Love, passion, sweat, and tears always go into making each and every one of my mermaid tails. 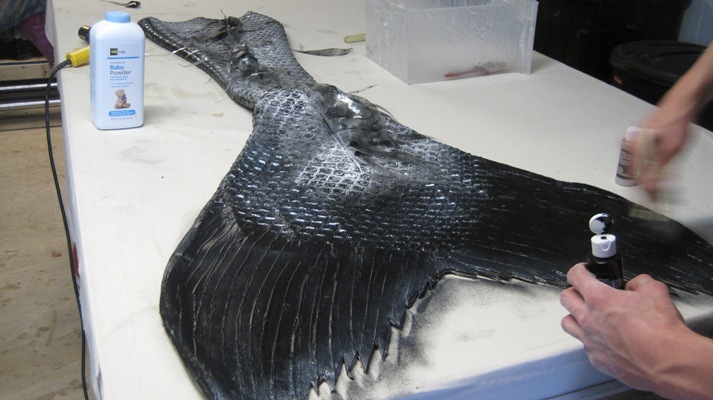 It’s not easy to create a workable mermaid tail. The great thing is that not only do I make them, but I also perform and swim in them myself. This allows me to make the best of the best. Do people seem to transform when they put on one of your tails — and in what ways, aside from the obvious? Let’s just say many of the models that I work with on photoshoots have no idea what they were expecting until they put one of our mermaid tails on. For many children, the ability to have and wear one of our mermaid tails means the world to them. That is what makes my job so special, making dreams come true. I understand that you rent performance-sized aquariums as well. How does that work? We do not rent the tanks. However, we hire out our traveling performance. Our traveling performances take place in a 900-gallon acrylic aquarium that is mobile. It fits into most venues with some restrictions. The tank allows us to perform short underwater ballet numbers or underwater posing mermaids or mermen. This type of performance is normally hired for night clubs and large scaled events. You have mermaids and mermen for hire for events, right? How do you select mermaids and mermen? What makes a good mermaid and a good merman? Yes, we do hire mermaids and mermen for events. From time to time we get phone calls from clients wanting mermaids for a pool party or a corporate event. Most of our mermaids are models or performers that we have worked with in the past. A great personality and positive attitude makes a good mermaid. It takes a lot to put on a tail and make it work. Does it ever seem that mermen get the short shrift? Do you have any advice for aspiring mermaids and mermen? Live your dream. Don’t stop dreaming. Never let anyone tell you that you cannot do what you want to in life. Always give 110% to everything that you do. If you want something bad enough, you will eventually get it! Eric is crazy talented and energetic–so happy to see him all interviewed up. What a Pro! Thank you so much for taking the time to meet with me at my studio! I love your blog. Great job! Very cool! Love the tails, they are gorgeous! I knew it! Exactly, what I wanted to do with the mermaid tail….oh my gosh! I am so happy, but I really, really want to try it! I want to buy the mermaid tail so bad! I had been dreaming about i even imagined of fantady mermaid. since i was younger boy i was playing around with the blanket, wrapping the around on my both legs, and making it look like I am mermaid. I have been saying the words, I wish I want to be mermaid. I just love that!!! What is the price of your tails ?? I would love one, so would my daughter. I love the tails, I would love to buy one!! i want one, how can i buy it?? i wish i could get a mermaid tail i love eric’s work all of the tails i have seenthat he has made are beautiful and wonderous. $2,500 is so greedy for silicone mermaid tail, what is the matter with you. are you begging for money, i want a silicone mermaid tail soooo badly but my mother isnt paying $2,500 for a silicone mermaid tail so bring the prices right down! 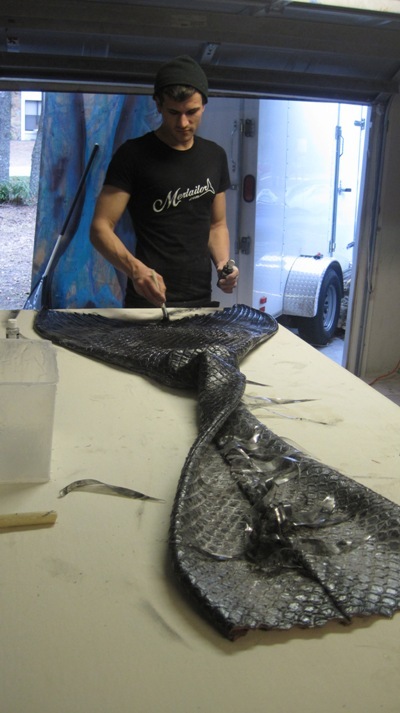 Each tail takes hours upon hours to make, and the materials Eric uses run about $900 per tail. You have to think about the seller before complaining about how “greedy” tailmakers can be. If you aren’t willing to pay, you’ll have to make your own. God bless you and your dreams with desires. Always dream as they are full of love. Eric love the tils but why do they have to be so expensive? soon i will be making silicone mermaid tails for a much cheaper price than your tails. My tails will be sold for $150 each no matter what the design. so if anyone wants one i will be posting another comment telling everyone that i have started making and selling the tails. The silicone that Eric uses is $185 per case, and you need 2 per tail. plus the molds, which would be a few hundred dollars. Plus the time and effort. There is NO WAY to sell silicone tails for $150 per tail. When do you think you will start selling the tails? i am not waisting $2,729 on a silicone mermaid tail. its impossible to save up that much money.only the very rich are able to afford that and its not fair on the people who arent rich. i want to do that when im older ,if you need kids you can count on me. how much are u going to sell your tails for? i wish i can have a mertailor tail because that is what i wished to be……. please can i have one???? Hey I love what you done with those mermaid talis do you think I can have one? I have actually already left a comment, but i realized that my goal is far from accomplished, Altogether i have only saved 38.67 and i will not get one of your tails like ever. I really would like on though. i am still twelve, my birthday is march sixth and the only thing i am asking for from my parents is one of your tails, but even with that i know i will not ever get one of your tails. I really wish i could buy one, but i cant. My summer job is over and by the time i get back to it i will have to start saving all over again. I know that this is a real long shot, but i would like to ask you and this is not at all even hopeful, that maybe possibly you could donate one of your tails to me. i know even as i ask that you never will, but i live in oregon and i would love on. please look me up and please consider my plea. Do u make mermaid tails for kids? If so, we’re can I get one? Thnx! Hi I am Hailey I am wondering if you make kid tails. I see all your adult tails but nerver any for kids. Please reply thanks and bye. where can i get one of your tails eric d!!!!!!! Will you make me a tail Eric? I always dreamed about being a real mermaid and these tails are so awesome I want one so bad but they’re really expensive. do you have any for kids and could you please let me know the prices please and thank you. You’re awesome please write me back at 304-441-0815 thanks. issues. When I look at your blog site in Safari, it looks fine but when opebing in Internet Explorer, it has some overlapping. Spud gets incarcerated for shoplifting while Renton emerges practically scot-free. Hello Mr. Eric I will live my email with you i Need to have a word with you …. This is ? Can I have a cheap mermaid tail I am 10 years old and I want to live my dream if I can have one that would be amazing to have one and if I can have one I want it to be black and green one I want the fin th be lafey fin thank you so so so much if I could have one can you dead it though the mail please.I think my nana or my mom may pay for it,when I mean cheap mermaid tail I mean like $102s. Greetings from the high deserts of New Mexico! I am an artist/cartoonist and love what you do. It’s amazing! Your incredible talents making those beautiful mer-tails is wonderful. Your detail is so realistic and a treat to the eyes. Then you are a great athlete on top of your talents and handsome face! I am totally thrilled by what you do! I happened to catch the TLC show featuring you today (11/12/2014), and was so hoping that Florida aquarium would have hired you. I was unpleasantly surprised that you weren’t hired. However, if I were in the film making business I would hire you in a scifi fantasy movie. I would also sell underwater poses of you for posters. You have star quality in my opinion. Keep on! It is a fun, bright, gracefull, and beautiful form of art that you do. I am a Tomboy who loves classic cars, old trucks, motorcycles, and though I don’t try to look like or be a guy, I hate dresses and being stuck in the kitchen isn’t my idea of fun. I’ve always walked to my own rhythm. A nonconformist for sure. I’m a 56 year old lady who has suffered lots of slings and arrows. I’ve paid my dues to bullies. I gotta be me! I love my country because freedom is her cornerstone. I’d be stoned to death in a Muslim country. Live free, my friend, live free!!!! Hope things are going good for you and yours! keep pace to date the great jo. Dust is the biggest concern when cleaning dollhouse furniture. Nowadays, Internet seems to be like the biggest market ever. Along with elegance it also makes the room warm and welcoming for the residents as well as the guests. Thank YOU for the meal!! But yeah, thanks for spending the time to talk about this topic here on your website. i think it is great that you are going with your dreams.what you feel is real.i hope y keep in touch. hi Eric Ducharme buy any chance do you sale patterns of your tails for do it your self or kits? I have been using a proper silicone mermaid tail for about 1 year now – it’s just amazing. It did cost me over $2000, but it’s so worth it. I have tried many others – especially cheaper ones under $500, all were inferior. What’s up,I log on to your blog named “The Mertailor Eric Ducharme and his Wondrous Tails | I am a mermaid” daily.Your humoristic style is witty, keep it up! And you can look our website about اغانى.